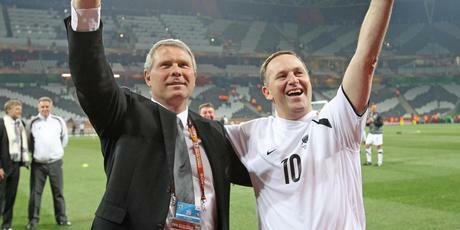 I don’t have much time today, but wanted to note the above image of John Key in an All White strip after this morning’s 1-1 victory over Italy. The significance of the event notwithstanding, the slightest chance of a result such as this, and its reflected glory, was surely a significant reason for Key to attend the All Whites-Italy match. Fair enough, too. It also reminded me of when then-PM Helen Clark donned a Kiwis Warriors jersey after a momentous rugby league victory (2005 Tri-Nations?). But for the life of me, I can’t find a photo of that event. I know it was pretty well-seen at the time — footage of the team celebrations with Clark was part of the post-match TV broadcast and made the news, but it’s like the stills have just vanished down the memory hole. Those look suspiciously like Steve Price’s forearms. Edit: Pat, in the comments, points out that I’m probably remembering the Warriors, not the Kiwis. Probably right. 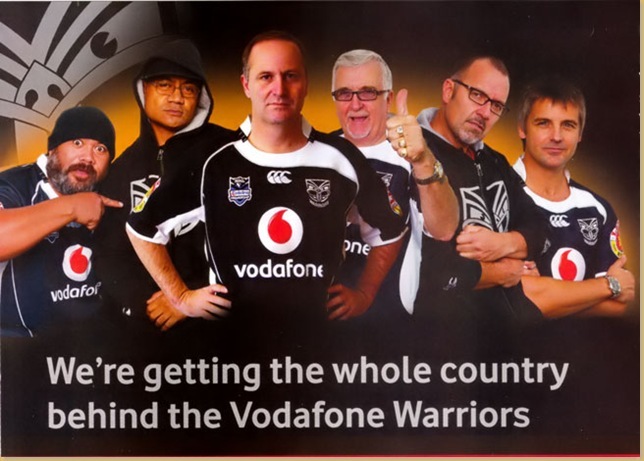 There are certainly a bunch of PR shots of Clark with the team after their 19 September 2009 playoff win over the Roosters — conveniently just a couple of weeks before the general election.